In a rare Q and A session with reporters, President Tsai Ing-wen dismissed rumors that there was a rift between herself and her top officials. The president said that she, her premier, and her secretary-general had a close working relationship that was to continue. She also stressed the importance of party unity as the DPP heads into the 2020 elections. 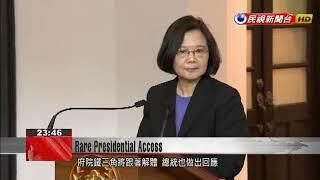 Today President Tsai met media in a corridor of the Presidential Office building. She addressed reports that the so-called New Tide faction of the DPP had turned on her in favor of supporting Premier Lai Ching-te for president. The matter of “forcing a ruler to abdicate” seems to be a popular topic. In a democracy, the government is nothing like an imperial court, nothing like that type of scenario. When this party faces a challenging predicament, unity is paramount. In the face of difficulties, infighting does not help. In fact, it is poisonous. President Tsai also addressed reports of divisions between herself and Premier Lai and Presidential Office Secretary-General Chen Chu. Over the past year or so, Premier Lai and I have had an inseparably close working relationship, and I believe this will continue into the future. I, Chen Chu and Premier Lai all get along very well. When we encounter our next challenge, we will consolidate the people in society who are our biggest source of strength. After delivering her prepared remarks, President Tsai took questions from reporters. For Taiwan’s media, it was a rare moment of access to the president as she sought to navigate a closer relationship with the people.